'Artists books explore ideas and concepts through form as much as content. They do this by, for example, disrupting the sequence and nature of the page, or using unconventional materials and printing techniques.' (Tate) Books can take many forms such as concertina books, flag books, tunnel books and some that barely look like books at all. I've always loved the book form as a way of presenting my work and I worked as a book illustrator for 20 years, so it seemed natural to make books using my photographs. I went on a bookbinding course run by Michael Waight, a master printer at Peacock Arts in Aberdeen with the intention of producing artists' books using both my photography and illustrations. When I begin work on a new book I experiment with lots of different techniques and materials to achieve the effect that I'm after. I like my books to be tactile and to reflect the images in some way. Some of my books are a mixture between artists' books and photobooks with overarching themes, while others use a single image to explore shapes and dimensions. The images are original photographic digital prints on fine art paper or original artwork and not reproductions. If you're interested in my books and would like to talk about any aspect of them, feel free to get in touch with me. I'm also available for commissions. Atlantic: Ebb and Flow concertina extended. Atlantic: Ebb and Flow book cover. Atlantic: Ebb and Flow detail. Atlantic: Ebb and Flow  A concertina artists’ book inspired by the sea. I’ve always been fascinated by the tide. The way it slowly washes up a beach to reach the high tide line and then retreats, and in so doing it completely transforms how the beach appears and feels. This book is my abstract interpretation of that continual tidal process. Details: Original artwork. Watercolour over textured gesso with gold ink highlights on handmade south Indian paper with deckled edge. Paper sheets connected with handmade hinges. 2 hard backs covered in south Indian handmade paper with blue line detail. Dimensions: h 220mm x w 170mm. Interior extending to w 450mm. This is a one off book. Please use the contact form if you would like to order Atlantic: Ebb and Flow or if you would like to know more about the book. Autumn Salix  The willow (salix) wood near my home was completely cut down last week and that prompted me to make an artists’ book from pressed leaves that I’d collected from the wood in autumn 2017 as a permanent reminder of those lovely trees. When I was collecting them I chose the fallen leaves that had interesting marks on them caused by caterpillars feeding in the summer when the leaves were soft and succulent. Details: A matchbox style handmade artists’ book with concertina book interior. Box dimensions: w 145mm x h 110mm. Hard covers in handmade screen printed Kathmandu Nepali paper over book boards. Concertina pages: six sheets of Daler Rowney 120gsm fine grain paper connected with individual hinges to form concertina. Each sheet measures w 135mm x h 95mm and has 5 pressed salix leaves attached. The book extends to 650mm when opened. A tab is attached to the concertina for ease of opening. 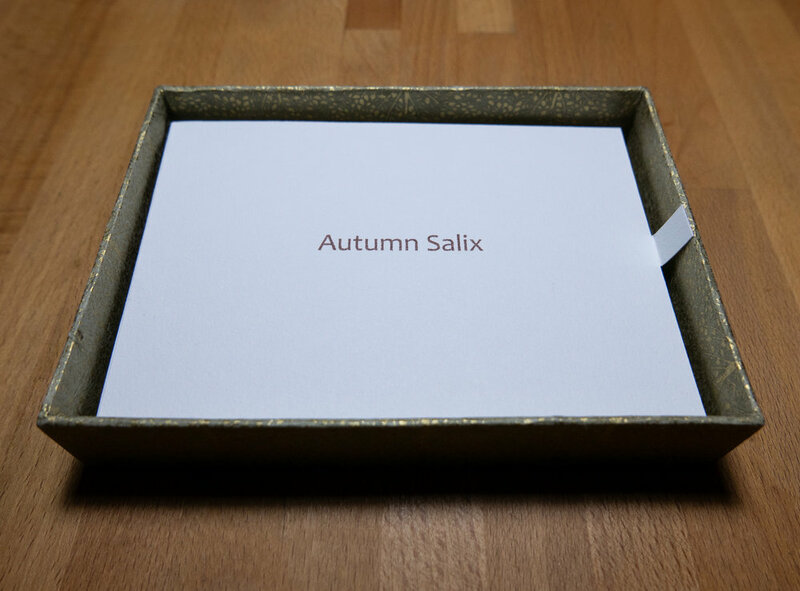 Please use the contact form if you would like to order Autumn Salix or if you would like to know more about the book. Hough Bay artists’ flag book with folded pages. Hough Bay, Tiree  Hough Bay lies on the Hebridean island of Tiree’s most westerly point facing the Atlantic Ocean. |t’s a lovely remote spot and I spent many happy hours taking photographs and beach combing picking up beautiful pebbles. While I walked up and down the beach I had an idea that I would like to make an artists’ book from the images I was making and I also wanted to show them with some of the physical objects found on that beach that day. The result is this custom made presentation box containing the book, some of the beautiful little pebbles and a glass bottle containing granules of sand from the beach. Details: Presentation Box Dimensions w 175mm x h 200mm x d 70mm handmade and covered in Chiyogami hand screen printed paper from Japan lined with Saunders Waterford watercolour textured paper. Presentation Box Interior contains handmade artists’ book, glass bottle with cork top containing Hough Bay sand (d 40mm x h 80mm). Handmade box with lid containing the pebbles (w 60mm x h 80mm). 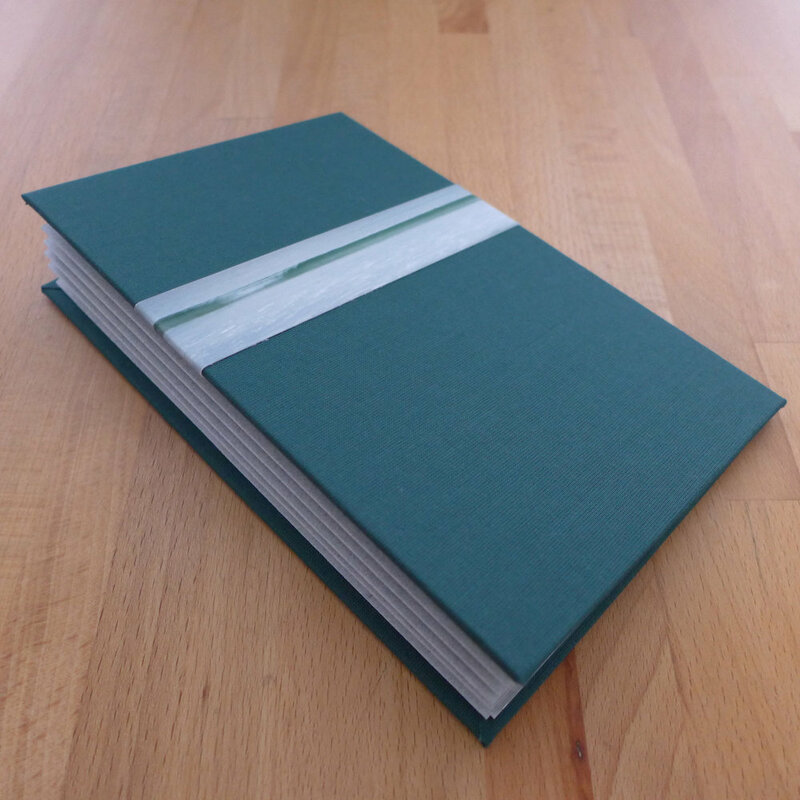 Artists’ Book Description: The form of this artists’ book is a flag book with folded pages. 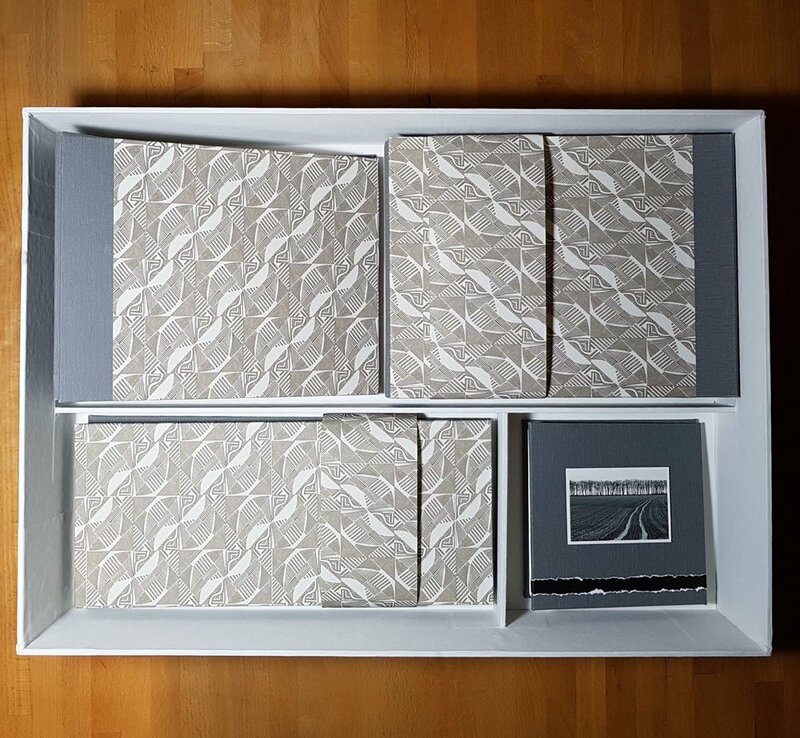 w 147mm x w 95mm; 2 hard backs covered in Chiyogami paper; concertina made from vintage watercolour paper; 10 photographs inkjet printed on to Fotospeed Platinum Etching 285 fine art paper with handmade hinges; endpapers both with hand cut map of Tiree showing position of Hough Bay. Book signed and dated. This a one off book with presentation box. Please use the contact form if you would like to order Hough Bay, Tiree or if you would like to know more about the book. Land Lines TRACKS artists’ book. Land Lines Triptych  In 2017 I moved from a house on the outskirts of Aberdeen surrounded by a large area of native woodland, to a house in rural Aberdeenshire bordered by open fields. Land Lines is my photographic response to my new surroundings, recording the patchwork of fields and the marks left on the land by farming practices. There are three elements within my photographs; tracks, furrows and boundaries. To conclude this part of the Land Lines photo project I have made a triptych of artists’ books using three different concertina forms each of which covers the individual elements. The books are contained in a handmade custom box. Many of the images printed in the books can be seen in Land Lines on this website. There are further images of the books in ‘Buy Books & Prints’. Details: FURROWS is a concertina book with signature pages sewn into the concertinas. I chose this book form as I felt the concertinas resemble the furrows in the fields. Book dimensions: h 175mm x h 220mm x d 85mm. Page dimensions: h 165mm x w 210mm. Average image dimension: h 115mm x w 170mm. 3 signatures of 6 pages sewn into the valleys of the concertina. 31 colour and black and white prints. Inkjet printed on Bockingford double sided watercolour paper 190gsm acid free and archival. 2 hard backs covered in Judd St Gallery Paper- Jonathan Gibbs, plus 100% cotton book cloth - Atlantic Gulf. Daler Rowney white fine grain endpapers. Black deckled edge detail on hinges and title page. Signed and dated. BOUNDARIES is a concertina book with 5 concertina hard backed covers and 3 interior concertinas displaying the images. The hard backed covers represent boundary lines in the landscape. Book dimensions: h 185mm x w 240mm x d 55mm extending to 780mm. Interior concertinas consist of 8 individual images printed double sided to enable the book to be viewed from all angles. Page dimensions: h 165mm x w 210mm. Average image Dimensions: h 110mm x w 170mm. Inkjet printed on Bockingford double sided watercolour paper 190gsm acid free and archival. Additional images (printed on Fotospeed Platinum Etching 285 fine art paper) displayed on the interior hard backs: Paper dimensions h 105mm x w 90mm. Image dimensions: h 80mm x w 70mm. 5 Hard backs covered in Judd St Gallery Paper - Jonathan Gibbs plus 100% cotton book cloth - Atlantic Gulf. Daler Rowney white fine grain endpapers. Black deckled edge detail on hinges, hard backs and title page. Signed and dated. TRACKS is a double concertina book a single signature sewn into the 1st concertina page. When extended, the shape of the concertina reminded me of the tracks left on the land by heavy farm vehicles. Book dimensions: h 134mm x w 300mm x d 25mm extending to 870mm. Paper dimensions: h 125mm x 142mm. Average image dimensions: h 90mm x w 115mm. Inkjet printed on Fotospeed Platinum Etching 285 fine art paper. Hard backs covered in Judd St Gallery Paper - Jonathan Gibbs plus 100% cotton book cloth - Altantic Gulf. Daler Rownety white fine grain endpapers. Black deckled edge detail on hinges and title page. Signed and dated. THE PROJECT BOOK is a concertina book with 5 wallets that hold individual cards describing the project, the three elements of furrows, tracks and boundaries and a certificate of authenticity. Book dimensions: h 130mm x w 130mm. Wallet dimensions: h 120mm x 120mm. Card dimensions (printed on Bockingford double sided watercolour paper 190gsm): h 110mm x w 100mm. Cover image dimensions (printed on Fotospeed Platinum Etching 285 fine art paper): h54mm x w 80mm. Hard backs covered in 100% cotton book cloth - Atlantic Gulf with Daler Rowney white fine grain endpapers. Black deckled edge detail. Signed and dated. PRESENTATION BOX is a handmade partitioned box to hold the triptych of books and the project book. Box dimensions: h 375mm x w 505mm x d 110mm. Covered in 100% cotton book cloth - Atlantic Gulf. Interior walls covered in white jaconette calico. Lines with Daler Rowney white fine grain paper. Please use the contact form if you would like to order Land Lines Triptych or if you would like to know more about the books. Tiree  Walking along a remote beach on the island of Tiree in the Hebrides, I came across the body of a gannet just above the tide line. There was an approaching storm, and strong winds were slowly covering the body of the gannet with sand. I was immediately struck by the shape the gannet had taken as if it was hovering on an updraft as it may have done in life. The colours on the bird, the sand, pebbles and the seaweed worked perfectly together as if they were deliberately assembled to please the eye. I have matched the tones with the book papers and book cloth to complement the images. The following day after the storm had passed I walked the same beach to take more photographs but the bird had gone, either covered with sand or washed out to sea. Details: Portfolio dimensions; h 232mm x w 320mm; 650mm when opened; hard backs covered in Japanese Chiyogami paper with buckram book cloth hinge; endpaper printed on Bockingford inkjet watercolour paper 190 gsm; wallet handmade with Fabriano pastel paper and buckram book cloth hinge detail; 6 A4 photographs printed on Hahnemuhle fine art rice paper 100gsm; accompanying hand stitched booklet with text h. 140mm x w. 100mm printed on Bockingford inkjet watercolour paper; booklet cover printed on Hahnemuhle fine art rice paper 100gsm. This is a one-off book. Please use the contact form if you would like to order Tiree or if you would like to know more about the portfolio. 24 Exposures - South Uist  This isn't an artists' book exactly but it stems from an original concept of using a paper scroll that moves through the camera mechanism. That idea didn't work in practise but it did make me consider using 35mm film that is directly painted on with acrylic. The film is an old unused 24 exposure Safeway 35mm film I had kept (why?) from 1993 and it is loaded into my old Minolta x-370s camera which was my last film camera and was used to take many photographs of Uist. The film moves through the camera by pressing the shutter button and winding the film on as you would an ordinary film but rather than exposing the film the viewer reveals the scene. The image to paint that immediately sprang to mind was the South Uist hill line because it is so engrained on my mind having seen them every day of my childhood growing up on the island. When I revisited South Uist after a 10 year absence the hill line was the thing that struck me the most. It was so familiar and I felt as if I had never been away. The view points are taken from various locations on the west coast of Uist and begins with the view across the sea to the neighbouring island of Barra which as a child seemed very distant. The scene sweeps left passed Eriskay to East Kilbride at the south end of South Uist and the location of the photographer Paul Strand's image included on the cover of his book 'Tir a Mhurain' (shown above). The hill line then begins with Roineabhal and moves on north to Ben Kenneth at Lochboisdale to Stulabhal, Beinn Mhor, Hecla and finally Ruabhal where the M.O.D has an observation station. The style of the painting is very simple and the hills and houses are unpainted areas of film showing through. The camera though a bit battered through a lot of use still works. Winter Trees  This is a concertina tunnel book with 9 individual prints of a single image I took in late March this year at Clashindarroch Forest in Aberdeenshire. A circular area is removed from the centre of each image with a decreasing diameter that forms the tunnel. Details: Book dimensions; h. 210mm x w. 280mm x d. 30mm extending to 250mm when opened; 3 hard backs covered in handmade Indian paper with tree/gold leaf print design; buckram cloth hinges; handmade Tsasho Bhutanese endpapers; concertinas inkjet printed with winter trees image on Bockingford watercolour 190gsm paper using ChromaLife 100 dye based inks; tunnel winter trees images printed on Fotospeed natural soft textured 315 fine art paper; suede tie fastening with metal leaf detail. Blue Feathers  Blue feathers was inspired by cyanotype photographic prints I've seen of natural materials. I've worked with scraperboard for illustrations in the past so I found it quite intuitive to carve simple feather shapes from rubber stamps so that I could produce images that have a simplistic print texture that I wanted for this book. Details: Concertina flag book holding 6 handmade library ticket type envelopes made from 'classic pages - paper state' paper (it's paper my dad bought about 20 years ago so its exact origin is unknown! ); book dimensions w. 95mm x h. 110mm high extending to 400mm. Prints 63mm wide x 80mm high; 6 hand made rubber stamp prints based on my drawings on Daler Rowner cartridge acid free paper using Tsukineko ink; the prints can be removed and put in any order you would like; concertina made from the same paper as the envelopes; 2 hard backs covered in Japanese Chiyogami paper. Please use the contact form if you would like to order Blue Feathers or if you would like to know more about the book. 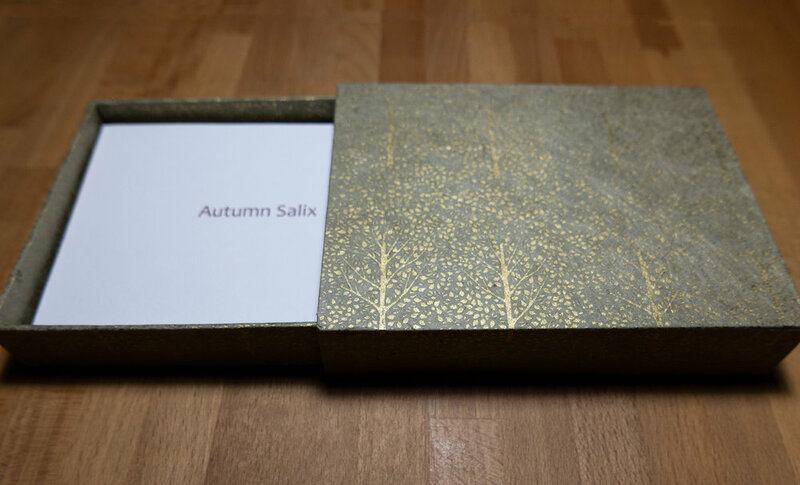 Autumn  This is a concertina type artists' book with windowed envelope covers. There are 8 removable interior printed leaf details made from a hand carved rubber stamp. The leaf prints illustrate the change in leaf colour as autumn approaches and the idea for this book was inspired by Keats poem 'Ode to Autumn - Season of mists and mellow fruitfulness'. Details: Concertina printed on Bockingford 190 gsm watercolour paper using dye-based ChromaLife100 inks from one of my autumn woodland photographs; book dimensions h. 150mm x w. 100 x d 20mm extending to 70mm; envelope covers made from Bockingford paper printed with dye-based inks; 2 removable cards with printed leaf detail inserted into envelope covers; interior concertina has 8 removable cards with printed leaf detail using Tsukineko inks; leaf prints - front cover w 95mm x h. 155; leaf prints - interior w. 50mm x h. 80mm. Please use the contact form if you would like to order Autumn or if you would like to know more about the book. Tree Line  A commissioned flag book with a photograph chosen by the collector from my Land Lines photo project. Details: Hard backed flag book of a single image. 6 flags wide and 4 flags deep. Images printed on Ice Duo Matte 320gsm. Concertina image printed on Hahnemuhle Rice Paper 100gsm. Hard backs covered in hand painted jaconette with Payne's Grey acrylic with hand painted torn line in black acrylic. 'Venation' scroll photographic prints included artists' book. Venation  is an artists' book that explores the vein like structures of fallen holly leaves that I found in my garden in winter. I've pressed the leaves and included them in a small bound book within the artists' book. Before pressing the leaves I photographed them in close detail, printed them on rice paper, scrolled them and then attached them to the artists' book. The leaves are arranged to show the stages as the leaf structure breaks down to reveal the venation. Details: Hard backed artists' book containing a 6 page hand bound book and 5 photographic print scrolls. Hard backs covered in Nepalese handmade batik rustic paper with buckram cloth hinges; h 160mm x w 195mm x d 50mm; Bhutanese hand made paper and lokta fibre sheet mix endpapers; hand bound book containing 8 pressed holly leaves on jaconette calico pages; lokta fibre sheet covers; 5 hand made cylinders consisting of layers of batik rustic paper (to contain scrolls); photographic prints on Hahnemuhle rice paper 100gsm using dye based inks. Land Lines  It is an introductory book produced to accompany my Land Lines project originally created for The Stills Gallery Book Market, Edinburgh. Details: Hard backed concertina book with 7 images; h 110mm x w 180mm extending to 500mm; front covered with printed image on Bockingford watercolour paper 190gsm; back covered with black paper; interior printed on Bockingford watercolour paper 190gsm using dye-based ChromaLife100 inks; individual prints connected with handmade hinges to form concertina; black acrylic painted paper line with deckled edge woven through the concertinas and round the back cover. Please use the contact form if you would like to order Land Lines or if you would like to know more about the book. Feathers  Seabird feathers photographed on a South Uist beach in the Outer Hebrides. The series shows different feathers that gradually become transparent over time. Details: Hard backed concertina book with 7 images; h 110mm x w 180mm extending to 500mm; front and back covered with Japanese Chiyogami paper; interior printed on Bockingford watercolour paper 190gsm using dye-based ChromaLife100 inks; individual prints connected with handmade hinges to form concertina. Please use the contact form if you would like to order Feathers or if you would like to know more about the book. Woodland Tunnel Book  Hard backed concertina tunnel book with 6 individual prints of a single image each with a circle area removed with decreasing diameter to form the tunnel; h 230mm x w 290mm extending to 150mm when opened; 3 hard back panels covered in Japanese Chiyogami paper with Buckram cloth hinges; handmade Indian endpapers; black card concertina; images printed on Permajet Photo Art Silk 290 fine art paper; suede tie fastening with metal leaf detail. Green Wave  A flag book consisting of 5 individual photographic prints cut into 3 sections and attached to a small concertina. When the book is opened the flags reveal a single image. Details: h 185mm x w 120mm extending to 320mm; 2 hard backs covered in Buckram cloth; concertina made of Fabriano pastel paper; cover, interior and endpaper images printed on Permajet Photo Art Silk 290 fine art paper using dye-based ChromaLife100 inks. Please use the contact form if you would like to order Green Wave or if you would like to know more about the book. Cabrach Doors  This is a more tradition form of book called a pamphlet book featuring some of the images from my Cabrach project. They are details of some of the old doors in the derelict cottages where the paint takes on wonderful colours and patterns with age. Details: h 110mm x w 115mm; 2 hard backs covered in Judd Street Gallery paper with buckram cloth hinges; 19 interior pages with images printed on Fotospeed NST Bright White 315 fine art paper using dye-based ChromalLife100 inks; book interior stitched; endpapers covered in jaconette. Please use the contact form if you would like to order Cabrach Doors or if you would like to know more about the book. Sky  Growing up on South Uist in the Outer Hebrides made me really appreciate big open skies with distant horizons. Over the space of 3 years I took photographs of Uist skies from west facing beaches overlooking the Atlantic. The horizon sits on the bottom edge of the photographs and no sea is included - just skies. Details: h 85mm x w 225mm extending to 1 metre; 2 detachable hard backs covered in alternating black and white paper; cover image and 11 interior images printed on Fotospeed Matt Ultra 240 fine art paper with dye-based ChromaLife100 inks; individual prints connected with handmade black hinges to form concertina. Please use the contact form if you would like to order Sky or if you would like to know more about the book. Woodland Portfolio  I've always really liked small square images and I wanted a way to present them as a set but not within a frame. I made a portfolio as a way of presenting my photographs which means the prints can be handled and the sequence mixed up. Details: h 150mm x w 150mm; 3 hard backs covered in Japanese Chiyogami paper with buckram cloth hinges; handmade Bhutanese endpapers; text printed on opaque sheet; handmade Bhutanese paper envelope with pressed birch leaf detail; handmade Indian protective sheet over photographs; 5 images 155mm x 135mm printed on Fotospeed NST Bright White 315 with dye-based ChromoLife 100 inks; suede tie fastening with metal effect leaf detail. Please use the contact form if you would like to order Woodland or if you would like to know more about the portfolio. Uist Sea portfolio  A collection of photographs taken from North Uist looking towards St. Kilda one February afternoon. Details: h 150mm x w 150mm; 3 hard backs covered in Japanese Chiyogami paper with buckram cloth hinges; handmade Indian endpapers; text printed on opaque sheet; handmade Indian paper envelope; handmade Indian paper protective sheet over photographs; 5 images 155mm x 155mm printed on Fotospeed NST Bright White 315 with dye-based ChromoLife100 inks; suede tie fastening with mother of pearl shell detail. Please use the contact form if you would like to order Uist Sea or if you would like to know more about the portfolio. Common Ground  Commission by the photographer David Baker for display in his exhibition 'Common Ground' at Southampton City Art Gallery. This is a double concertina artists' book which consists of 2 lengths of concertinas stitched together to form cubes. I was asked to produce my artistic interpretation of David's photographs of Southampton Common using whichever mediums I thought would fit the project. I used mixed media including charcoal, gouache, coloured pencil, ink, acrylic, graphite, dried grass stems and pressed birch leaves. The artists' book has 2 hard backs covered in buckram cloth and measures approximately h 240mm x w 190mm and when extended stretches to over 1 metre. The Chase  This little book is an illustrated title using original pen and ink drawings. I produce the drawings for each individual book, concertina the paper and add book covers. I worked as a children's book illustrator for 20 years and I wanted to use illustration in one of my artists' books. I love dogs and this is a wordless story of a small dog's daily visit to the park chasing a ball. The book can be used as a conventional book, or if you remove the spine it becomes a concertina book. The covers are removable to leave the artwork on its own. Details: h 150mm x w 105mm extending to 360mm; 2 hard backs covered in paper with front cover image printed; interior images drawn in ink with tones in pencil on cartridge paper. Please use the contact form if you would like to order The Chase or if you would like to know more about the book.